Have you got pest Problems? The presence of rodent or insect pests often causes embarrassment and distress and can lead to loss of business, goodwill, and reputation. 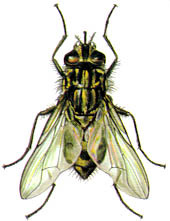 In addition, these pests may contaminate products and food and can cause food poisoning. Can Scorpion Pest Control Services Help? Scorpion Pest Control Services is a well-established organization with well-trained staff (all our operatives are trained at least to the level of health standard and have years of experience), and our service provision is equal to any on the market. Our liaison with the Environmental Health Section also allows greater co-operation with local enforcement bodies and this gives a more direct and comprehensive information base for related matters. 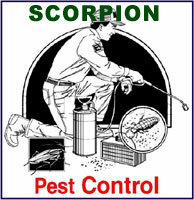 Scorpion Pest Control Services offers a professional pest control service covering whole Bangladesh. We are committed to providing and maintaining the highest level of service to all our customers whether for your home or for your business. A professional, efficient and friendly service is guaranteed. Our rates are reasonable and competitive. We cover all pests: rats, mice, squirrels, moles, pigeons, flies, fleas, bedbugs, moths, cockroaches, carpet and larder beetles, stored product pests and many more. Why both residents and businesses need to take action? Control and prevention of pest infestations in your home, workplace, and environment requires a cooperative effort - a partnership - between the client and the pest management provider. The stronger the partnership, the more successful the partnership will be. Preventive measures are designed to keep the pest population below injury level so that infestation cannot be developed in the stored products. They require a continuous programme of work or disinfestations treatment on the part of the persons concerned. When you notice or are shown evidence of rodent or insect pests, do you know what action to take to eliminate the problem? You shouldn't wait until it is too late; prevention is better than cure. Have you considered taking advice or treatment from Scorpion Pest Control Services? An important aspect of pest control is denial of access to pests and maintenance of an environment, which discourages the development of infestation. 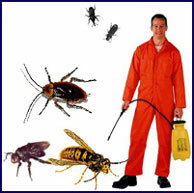 General Pest Control Service includes treatments to control Mosquitoes, German, Oriental, American and Brown Banded Cockroaches, Spiders, Scorpions, Ants, Pill bugs, Stored Product Pests, Ticks & Fleas, Flies, Lizards, Rodent Control, Tree (both shade and fruit-bearing) pests. If you are a food preparation, storage or retailing business infestations are unacceptable we can help you by ensuring that your premises complies with the Govt. Food Safety Act. Multihousing Pest Management is a control strategy to eliminate the German cockroach, the primary multihousing pest. To insure success of this program, each unit of an entire building is inspected and treated in order to address the entire cockroach population. Reduced Impact Exclusion is the name of the service we use to manage pest problems while reducing pesticide exposure to people, property and the environment. 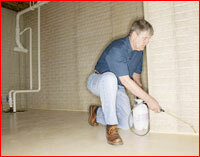 A thorough interior inspection and treatment when needed. Application to the attic and crawl spaces. Pest includes: Oriental roaches, American roaches, centipedes, crickets, millipedes, pill bugs, scorpions, sow bugs, spiders, and wasps. Commercial Pest Control Solutions - Specialising in the Commercial and Industrial sector Scorpion Pest Control Services is fully committed to providing and maintaining the highest level of service. Current customers include: International hotel, embassies, garments sector, pharmaceuticals company, waste transfer stations, warehouses, industrial estates, offices, schools, restaurants, public houses etc. 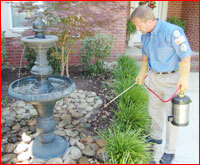 Whether you need to eradicate an existing pest problem or wish to maintain a pest free environment. You will find our service professional, friendly and efficient and our charges competitive. Service Contracts - Our service contracts are designed to ensure that they cover your requirements and cover only the necessary pests with the right number of visits. There are no hidden extras. With our quotes you will receive: Free survey, Full and detailed report including recommendations, Method Statement. Guarantee - If you are not completely satisfied within 7 days of program treatments, we will provide another service at free of cost. There will be no charge for callbacks. This service will not include any wood destroying or flying insects (other than wasp). You will be notified by postcard when service is due. 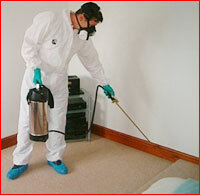 Technical Specification - All pests are dealt with (i.e. rats, mice, moles, squirrels, fleas, flies, wasps, cockroaches, bed bugs etc.) fast, efficiently and professionally. The pesticides that are being used for pest and rodent control services are not dangerous on human or have no detrimental effects on human and are not toxic for hazardous to human being. These pesticides are also of no damaging effect on Furniture, Carpets, Fabrics, Paper, Electric Conduits PVE, Rubber Mats etc. and the pesticides are effective to kill all pest, insects within 10 minutes. Total-quality-assured programs for food processing, manufacturing, food distribution, supermarkets, hotel/motels, food service, restaurants, healthcare facilities, and retail establishments. Nature of Service - Residual Spraying, Mist Blower Fog, Fog Generated Spraying, Gaseous Spraying System Disinfestations Treatment. (Wherever necessary).